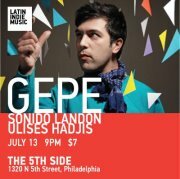 Gepe, Sonido Landon & Ulises Hadjis: a night of Latin indie music! The 5th Side, a creative cultural hub in South Kensington, Philadelphia, presents a night of Latin indie music! I love Latin music, so experiencing Latin indie music will be a pleasure!